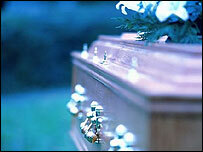 BBC NEWS | UK | Magazine | When is a missing person declared dead? A man declared dead by a coroner has turned up alive. So if there's no body, when is a person officially "dead"? Thirteen months after John Darwin disappeared while canoeing near Hartlepool, a coroner recorded an open verdict at his inquest. Four years later, he walked into a London police station, alive and well. So what's the process for a missing person to be declared dead? When someone goes missing, the police will try to establish whether the person has died by checking bank accounts and investigating possible sightings. If they believe there should be an inquest, possibly to help the family receive a death certificate and reach closure, they will file a report to the local coroner. This will indicate if there are any suspicious circumstances. The coroner has to apply to the secretary of state (then home secretary, now justice secretary) under section 15 of the Coroners Act 1988 for permission for an inquest with no body. There is no time limit in such cases; the rule to wait seven years may only apply in the High Court on the settlement of an estate. "In this case the secretary of state would have agreed to the order and the inquest would have been held," says a spokesman for the Ministry of Justice. The number of requests received is less than 10 a year, he adds, and few are refused. Sometimes there is an emotional pressure from the family who are desperate for a death certificate so they can move on, says one coroner, who does not want to be named. But an inquest without a body operates very much on the evidence provided by the police, he says, and whether senior officers believe the individual in question has genuinely died. Malcolm Donnelly, the coroner who held Mr Darwin's inquest, says he recorded an open verdict because the exact circumstances were unclear. "I found he had probably died on or about the date of disappearance." That decision was based on a balance of probability, and not beyond reasonable doubt. At the end of an inquest, the coroner sends a death certificate to the Register of Births and Deaths, relating the findings of the inquest. This allows the family to register the death and get a state death certificate. This is used to claim on a life insurance policy - the insurer will normally require sight of the original death certificate as proof of death, says Jonathan French of the Association of British Insurers. "Insurers may also make a discretionary payment, even without a formal declaration of death. This happened in several cases following the tsunami in 2004. "If the circumstances around a claim change, the claimant should inform the insurance company and may be required to pay back any money they had received. If there are suspicious circumstances, then a police investigation will take place. Insurers may also themselves initiate legal proceedings if there is evidence of fraud."